AST Ethical Living...: Happy New Year! Chinese New Year is on Friday, January 31, 2014. It marks the start of the Year of the Wood Horse in the Chinese zodiac. 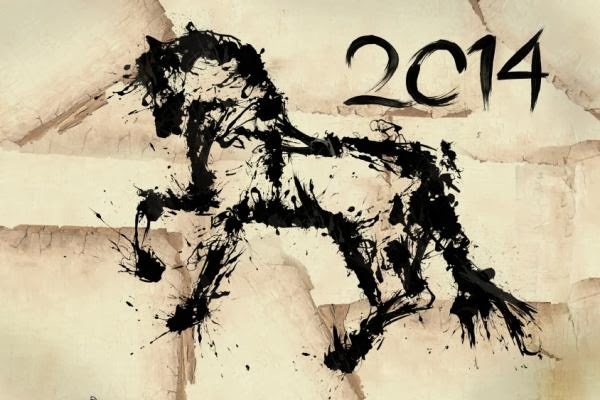 the year of the Wood Horse 2014. If you are interested in where the tradition comes from and what it is based upon, we will look into that, too! 2014 is the Year of the Wood element - the Wood Horse - so to be in harmony with the energy of the year and befriend the ruling Wood Horse energy, it is recommended to wear the colours of the Wood feng shui element - all shades of green and brown. In addition to Wood feng shui element, you can also wear the colours of the Water and Earth elements, because these two elements support the Wood in its growth and well-being. So, colours blue and black (Water element colours) as well as all earthy tones (Earth element) are also good in the coming year of the Wood Horse 2014. You can wear not only clothing, but all sorts of accessories in the green-brown colour scheme, such as jewelry, belts, scarfs, etc. To make it even more powerful, you can choose jewellery with natural crystals and stones with the presence of Wood energy, such as green jade, agate, green tourmaline and malachite. Also good are crystals and stones with the presence of Water element energy - such as turquoise, aquamarine, pearls, kyanite, lapis lazuli and moonstone. Or, go for black colour ones, such as black obsidian, black tourmaline or black onyx. Are there colours that are best to avoid in the New Year, or at least for the New Year celebration? Yes, for sure. Least favourable colours in 2014 are the colours of Fire and Metal feng shui elements, respectively all whites and grays, as well as purple, orange and red colours. However, because Horses are considered to have the energy of fire, it is OK to wear accessories in Fire feng shui element colours.